Your wedding will be shot using two discreet cinema style cameras, cinematic lenses, and professional audio recording devices. It will be edited carefully and time will be spent in editing to determine the correct angle is chosen at the perfect time. I pride myself on recognising when people are looking their best and I only show people in their very best light. 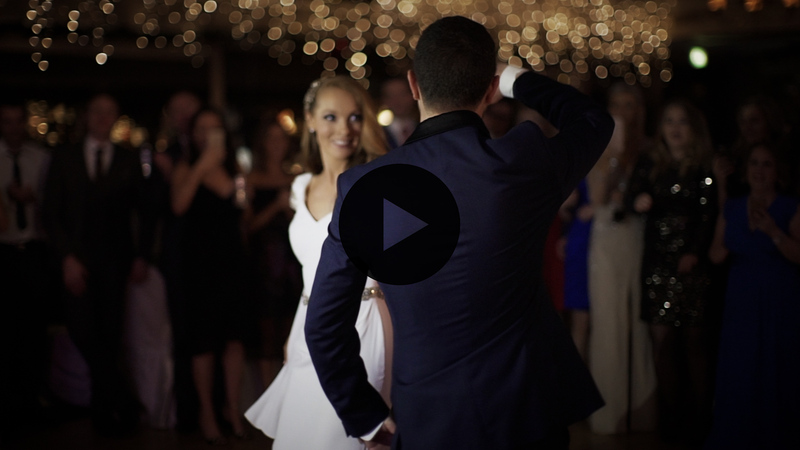 This is a detailed and creative film with a series of music videos along with the full Ceremony & Speeches. Coverage begins at Bridal Prep at the brides house/venue on the morning of the wedding. From there all of the important aspects of the day get extensively covered. Groomsmen and guests arriving at church. Brides arrival. Ceremony is filmed using 2 cameras and professional audio recorders. Key areas of Ceremony coverage are Bride walking up Aisle, lighting of candles, Priests sermon, readings, wedding vows, lighting of centre candle, prayers of the faithful, bringing up of gifts, communion, communion reflection (Religious ceremonies are approximately 30 minutes after editing. Signing of register, Walkdown isle and Greeting line. Family photo session, Guests socialising, Bridal party shots, Creative Couple shots & Hotel function room shots. about. Cutting of the cake. The first dance & first 20 minutes of dancing. An included 4 minute Cinematic highlights film closes out the wedding film (see highlights samples online). edited into an entertaining montage in this package. Video Messages to B&G. Let your guests wish you well on Camera. This is provided as an additional chapter on the Wedding Film. Price is for approx 15-20 short guest messages. Price €150. A travel fee may apply. Please inquire. This film should demonstrate the Editing style of the Ceremony, Speeches & Dancing of the Feature Film. This particular example also involved a Groom Prep as well as a Bridal Prep and the Groom Richard spent some time preparing a letter for the Bride to read. He asked me to deliver the letter to her, which I did but not before I got a recording of him reading it out. Although recording audio is not for everybody I do think it worked nicely in this particular example.
" There are not enough words to describe Ger's work "
" He is a true artist at what he does, and our video turned out so incredibly beautiful ....... If you are lucky enough to have the opportunity to hire Ger I suggest you do not hesitate "